The Fløibanen funicular in Bergen is one of Norway’s best-known attractions and the only railway of its kind in the country. Fløibanen runs from the centre of Bergen to the summit of Fløyen in 5-8 minutes, and the journey is an experience in itself. The journey starts at the lower station, in the heart of Bergen, about 150 m from Fisketorget – the fish market – and Bryggen wharf. There are three intermediate stations on the way to the top: Promsgate, Fjellveien and Skansemyren, and the journey takes 5-8 minutes. At Fløibanen’s upper station (320 m above sea level), there is a cafè, souvenir shop and restaurant. Fløibanen runs on rails up the steep mountainside to Fløyen, and has been in operation since 1918. Today’s modern carriages have glass ceilings and panoramic windows to afford the best views, and offer easy accessibility for prams/pushchairs and wheelchair users. We are open daily all year round from early morning to 23.00. At times of high demand, the funicular runs continuously, carrying approximately 80 passengers each time. There has been a steady increase in traffic in recent years, and 2018 was a fantastic year, with new records set in several months and a new annual record of 2 023 786 journeys made. 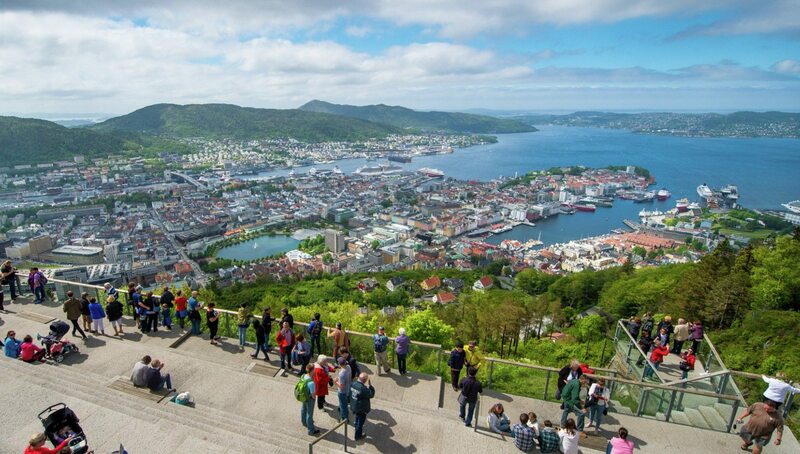 From the magnificent viewing platform on the top of Fløyen (320 m above sea level), you can enjoy stunning views of Bergen and the surrounding fjord and mountain landscape. It can’t be put into words and simply has to be seen! Fløibanen’s upper station is, of course, also the ideal starting point for exploring the mountains around Bergen. Taking Fløibanen to the summit of Fløyen brings you to an excellent walking area offering a wide variety of footpaths, walking paths, trails and viewpoints. Places for open fires, stone-built barbecues and picnic huts are also provided for your use. The many footpaths and waymarked trails make Fløyen an eldorado for year-round experiences in the great outdoors. Fløyen is also the perfect starting point for longer walks in the mountains around Bergen. Ask for our hiking guide, which contains 10 suggested walks and hikes of varying lengths and durations in the Fløyen area. In summer, various activities are arranged on Fløyen such as treasure hunts, mountain biking, guided tours, zipline, canoeing and fishing.